Here is a very brief introduction to Stoicism, both as an ancient Greco-Roman philosophy, and as modern practice. Please make sure to check several of the other sources listed on this site for a more in-depth look. To begin with, this is a handy spreadsheet with basic Stoic terminology. History. Stoicism was founded by Zeno of Citium (modern Cyprus) around 301 BCE, and it takes its name from the Stoa Poikile (painted porch), a public market in Athens when the Stoics met and engaged in philosophical discussions with anyone who was interested. A second major figure of the so-called “early Stoa” was Chrysippus, who is actually credited with elaborating most of the doctrines that are still associated with Stoicism. The early Stoics were of course influenced by previous philosophical schools and thinkers, in particular by Socrates and the Cynics, but also the Academics (followers of Plato) and the Skeptics. The second period of Stoic history, referred to as the “middle Stoa,” saw the philosophy introduced to Rome. Cicero (not himself a Stoic, but sympathetic to the idea) is one of our major sources for both the early and the middle Stoa, since otherwise we have only fragments of the writings of the Stoics up to that point. The third and last period is referred to as the “late Stoa,” and it took place during Imperial Rome; it included the famous Stoics whose writings have been preserved in sizable parts: Gaius Musonius Rufus, Seneca, Epictetus, and Marcus Aurelius. Once Christianity became the official Roman religion Stoicism declined, together with a number of other schools of thought (e.g., Epicureanism). The idea, however, survived in a number of historical figures who were influenced by it (even though they were sometimes critical of it), including some of the early Church Fathers, Boethius, Thomas Aquinas, Giordano Bruno, Thomas More, Erasmus, Montaigne, Francis Bacon, Descartes, Montesquieu, and Spinoza. Modern Existentialism and neo-orthodox Protestant theology have also been influenced by Stoicism. The philosophy is currently seeing a rebirth, and has deeply influenced modern practices such as logo-therapy and cognitive behavioral therapy. It also has a number of similarities and overlaps with modern philosophical approaches such as Buddhism and secular humanism. The Stoic Egg. The Stoics thought that (practical) ethics was the most important component of their philosophy: it was about how to live one’s life in the best possible way. However, they also believed that it is hard to develop a viable ethics without two other components: understanding how the world works, and appreciating the power and limits of human reasoning. 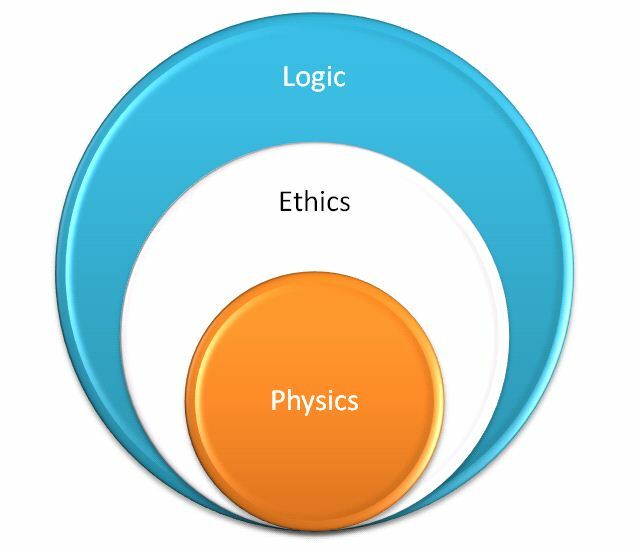 Stoicism, therefore, was made of three areas of study: ethics (more on this below), “physics,” and “logic.” By physics the Stoics meant something that by today’s meanings would encompass natural science and metaphysics, or what was once called natural philosophy. Of course, many of the original Stoic notions about the world have been superseded by modern science, which would not have surprised the ancient philosophers (they were very conscious of the limits of human knowledge, and very open to revise their specific beliefs). Briefly, however, Stoic physics included the idea that the universe began in a cosmic fire (and will end the same way, only to begin anew). 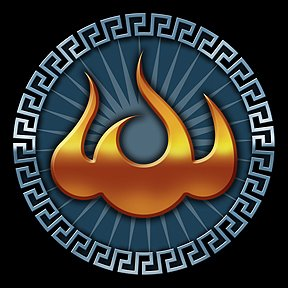 [The Stoic fire is represented in the symbol in the image at the top of this page.] They also believed that the world is made of matter, and that causation is a universal phenomenon, i.e., everything that happens has a cause. Finally, the universe is organized according to rational principles, the Logos. This can be interpreted as God (for instance in Epictetus), but also simply as the idea that Nature is understandable by way of rationality (which is why we can scientifically investigate it). 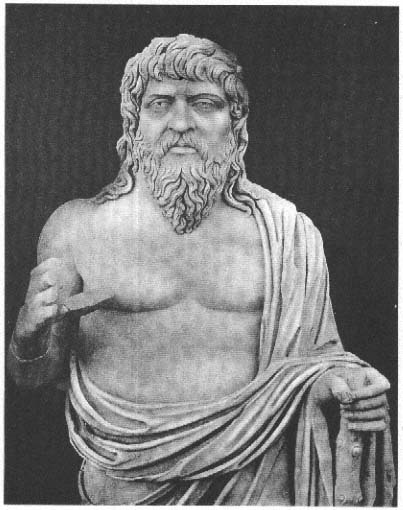 A crucial idea that the Stoics derived from their physics is that life ought to be lived “according to Nature,” which can then in turn be interpreted as “in agreement with what Zeus (God) has ordained,” or simply lived according to reason, developing to its best that most specific attribute of the human animal. Being a secular person, I obviously go for the latter interpretation. In terms of Stoic logic, the word encompassed the study of logic as we narrowly understanding it today, plus rhetoric, epistemology (i.e., a theory of knowledge), as well as what we would call psychology and related social sciences. The Stoics invented a system of logic alternative to that of Aristotle, which was largely ignored throughout the middle ages and beyond, until it began to be appreciated again with the modern advent of propositional logic (of which the Stoic variety is a type). The Stoics distinguished between the existence of corporeal and abstract things, like a number of modern philosophers do (say, respectively, physical objects and mathematical concepts). They thought that knowledge can be attained by reason, which is in principle capable of separating true from false (they were certainly more optimistic about this than their contemporary and critics, the Skeptics). Importantly, the Stoics also adopted a very modern belief that knowledge can be achieved only by peer expertise subject to collective judgment (the way modern science works, for instance). Ethics and practical philosophy. I assume the main reason people are reading this is not because of their interest in Stoic physics or logic – as fascinating as they are in their own regard – but because they want to learn about Stoic ethics, which is more immediately linked to their practical philosophy. So here we go, then. The first thing to get out of the way is the misconception that Stoicism is about suppressing one’s emotions and going through life with a stiff upper lip. No, Mr. Spock was not a Stoic (despite the fact that, apparently, Gene Roddenberry imagined the character according to his own, simplistic, view of what a Stoic would be like). Rather, Stoics taught to transform emotions in order to achieve inner calm. Emotions – of fear, or anger, or love, say – are instinctive human reactions to certain situations, and cannot be avoided. But the reflective mind can distance itself from the raw emotion and contemplate whether the emotion in question should (or should not) be given “assent,” i.e., should be appropriated and cultivated. To be a little more specific, the Stoics distinguished between propathos (instinctive reaction) and eupathos (feelings resulting from correct judgment), and their goal was to achieve apatheia, or peace of mind, resulting from clear judgment and maintenance of equanimity in life. Another crucial Stoic idea, and a corollary of the centrality of virtue in one’s life, is the distinction between preferred and dispreferred “indifferents”: wealth, health, and other goods are indifferent in the sense that they do not affect one’s moral worth (i.e., one can be a moral person regardless of whether one is sick or healthy, poor or rich). But some are helpful in pursuing our goals, and are therefore preferred, while others are an hindrance, and are therefore dispreferred. This makes Stoic doctrine a little less stern than it is usually thought to be (though certainly more so than Epicureanism, or Aristotelian virtue ethics). Stoics made a sharp (perhaps too sharp) distinction between things that are under our control and things that lay outside of it. The first category included mostly our own thoughts and attitudes, while the second category included pretty much everything else. (For a funny rendition of this distinction, see this short bit by comedian Michael Connell.) The idea was that peace of mind comes from focusing on what we can actually control, rather than wasting emotional energy on what we cannot control. However, do not take this as a counsel for despair about affecting human affairs; remember, many prominent Stoics were politicians, generals, or emperors, and they certainly spent a significant amount of energy and resources attempting to change things for the better. But they also accepted that when things didn’t go their way that was it, and there was no sense in dwelling on it. Indeed, Stoics thought of their philosophy as a philosophy of love, and they actively cultivated a concern not just for themselves and their family and friends, but for humanity at large, and even for Nature itself (see below). Stoic philosophers were interested in improving humanity’s welfare, and some were even vegetarian. * Also in the morning, I pick one of my favorite sayings from the ancients (a continuously updated collection can be found here), read it over a few times, and contemplate it as inspiration. 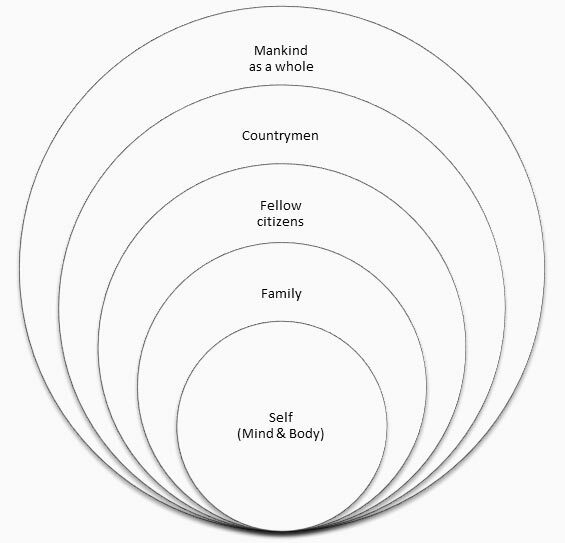 * Hierocles’ Circle: this is a visualization exercise, during which you begin by thinking about your own self, then mentally expand your circle of concern (see figure) to your family, your friends, people living in your neighborhood and your city, and then gradually to all of humankind, and finally to nature itself. It is a way to remind you that the rest of the world is just as important as you are, and that you should make it a habit of being concerned about it. * Premeditatio malorum: this exercise consists in visualizing (not just verbally describing) something bad happening to you, in order to overcome your fear of it and to better prepare yourself in case it actually happens. The specific visualization may be something as simple as anticipating your irritation at fellow riders in the subway (or drivers on the road), to the occurrence of your own death (I would recommend to reserve the latter for when you feel more confident in your Stoicism, and to do it only occasionally – it can be disturbing). This is similar to exercises in cognitive behavioral therapy designed to overcome one’s fears or anxieties. * Mindfulness about (moral) choices: this is to be done throughout the day, and it is a distinctly Stoic type of mindfulness, as opposed to the Buddhist variety, for instance. The Stoics taught us to live “hic et nunc,” in the here and now, i.e., paying attention to what we are doing, achieving what some modern psychologists call “flow” in our actions. But a crucial component of this mindfulness is paying attention to the fact that your choices, even the apparently trivial ones, very likely have an inextricable ethical component to them, and you should be aware of it and chose according to virtue. * Evening meditation (philosophical diary): before going to bed, do the reverse of the morning meditation, going through the salient events of the day and asking yourself Epictetus’ three questions: What did I do right? What did I do wrong? What duty’s left undone? It helps to carry out this exercise by writing a personal philosophical diary, in the style of Marcus Aurelius (not meant for publication!). The idea is to learn from what has happened during the day, clear your mind, and go to sleep in peace. 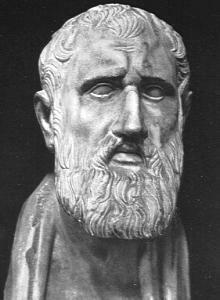 Zeno of Citium (c. 334 – c. 262 BCE) originated from Citium, currently Cyprus, possibly of Phoenician descent. Zeno was the original founder of the Stoic school of philosophy, which he taught in Athens from about 300 BCE. Based on the moral ideas of the Cynics, Stoicism laid great emphasis on goodness and peace of mind, gained from living a life of Virtue in accordance with Nature. It proved very successful, and flourished as the dominant philosophy from the Hellenistic period through to the Roman era. Chrysippus of Soli (c. 279 – c. 206 BCE) was a Greek Stoic philosopher. He was a native of Soli, Cilicia, but moved to Athens as a young man, where he became a pupil of Cleanthes in the Stoic school. When Cleanthes died, around 230 BCE, Chrysippus became the third head of the school. 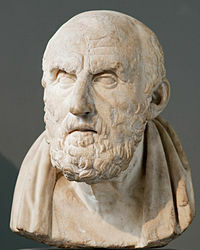 A prolific writer, Chrysippus expanded the fundamental doctrines of Zeno of Citium, the founder of the school, which earned him the title of Second Founder of Stoicism. Marcus Porcius Cato Uticensis (95 BCE, Rome – April 46 BCE, Utica), commonly known as Cato the Younger (Cato Minor) to distinguish him from his great-grandfather (Cato the Elder), was a politician and statesman in the late Roman Republic, and a follower of the Stoic philosophy. 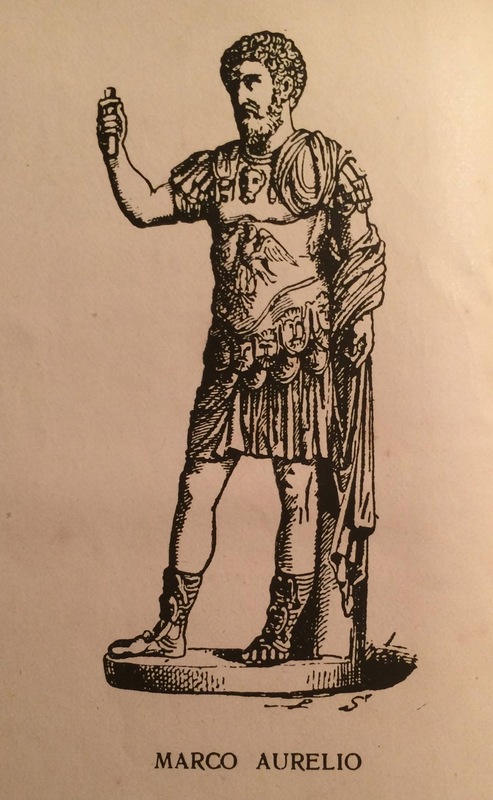 A noted orator, he is remembered for his stubbornness and tenacity (especially in his lengthy conflict with Julius Caesar), as well as his immunity to bribes, his moral integrity, and his famous distaste for the ubiquitous corruption of the period. Porcia Catonis (c.70 BCE – June 43 BCE (or October 42 BCE)), Porcia “of Cato”, in full Porcia Catonis filia, “Porcia the daughter of Cato,” also known simply as Porcia, occasionally spelled “Portia” especially in 18th-century English literature, was a Roman woman who lived in the 1st century BCE. She was the daughter of Marcus Porcius Cato Uticencis and his first wife Atilia. 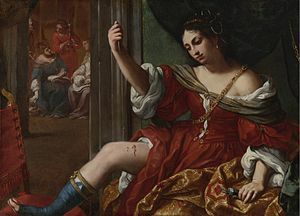 She is best known for being the second wife of Marcus Junius Brutus, the most famous of Julius Caesar’s assassins, and for her suicide, reputedly by swallowing live coals. 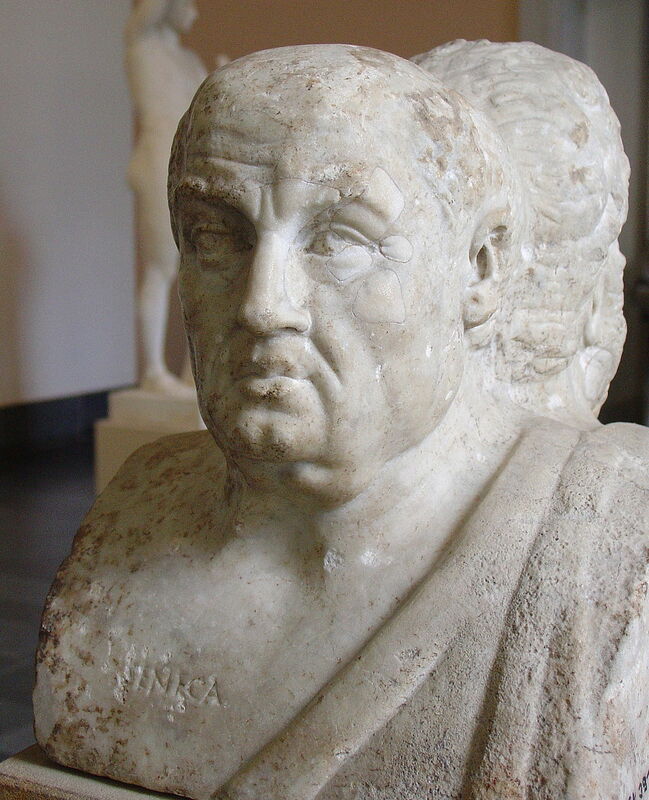 Lucius Annaeus Seneca (often known simply as Seneca; c. 4 BCE – CE 65) was a Roman Stoic philosopher, statesman, dramatist, and in one work humorist, of the Silver Age of Latin literature. He was a tutor and later advisor to emperor Nero. While he was forced to commit suicide for alleged complicity in the Pisonian conspiracy to assassinate Nero, he may have been innocent. His father was Seneca the Elder, his elder brother was Lucius Junius Gallio Annaeanus, called Gallio in the Bible, and his nephew was the poet Lucan. 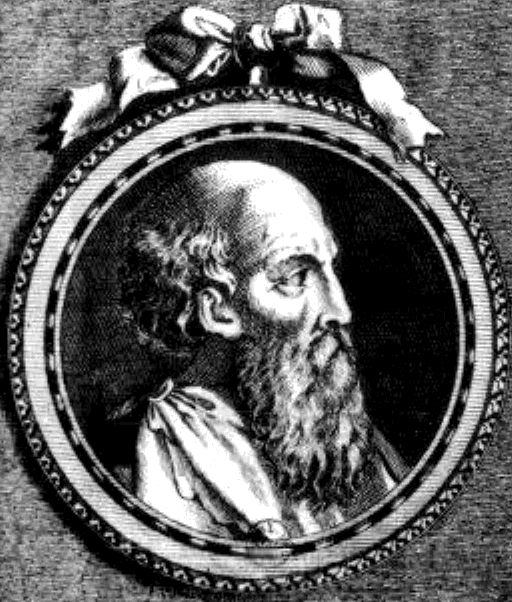 Gaius Musonius Rufus was a Roman Stoic philosopher of the 1st century CE. He taught philosophy in Rome during the reign of Nero, as consequence of which he was sent into exile in 65 CE, only returning to Rome under Galba. He was allowed to stay in Rome when Vespasian banished all the other philosophers from the city in 71 CE, although he was eventually banished anyway, only returning after Vespasian’s death. A collection of extracts from his lectures still survives. He is also remembered for being the teacher of Epictetus. Epictetus (CE. c. 55 – 135) was a Greek Stoic philosopher. He was born a slave at Hierapolis, Phrygia (present day Pamukkale, Turkey), and lived in Rome until his banishment, when he went to Nicopolis in north-western Greece for the rest of his life. His teachings were written down and published by his pupil Arrian in his Discourses. Epictetus taught that philosophy is a way of life and not just a theoretical discipline. To Epictetus, all external events are determined by fate, and are thus beyond our control; we should accept whatever happens calmly and dispassionately. However, individuals are responsible for their own actions, which they can examine and control through rigorous self-discipline. Marcus Aurelius (Latin: Marcus Aurelius Antoninus Augustus; 26 April 121 – 17 March 180 CE) was Roman Emperor from 161 to 180. He ruled with Lucius Verus as co-emperor from 161 until Verus’ death in 169. He was the last of the Five Good Emperors, and is also considered one of the most important Stoic philosophers. Marcus Aurelius’ Stoic tome Meditations, written in Greek while on campaign between 170 and 180, is still revered as a literary monument to a philosophy of service and duty, describing how to find and preserve equanimity in the midst of conflict by following nature as a source of guidance and inspiration. The above, again, is a very brief and necessarily incomplete introduction. There are a number of very good web sites and books devoted to all aspects of Stoicism, so be sure to check out the other resources listed on the other pages of this blog.